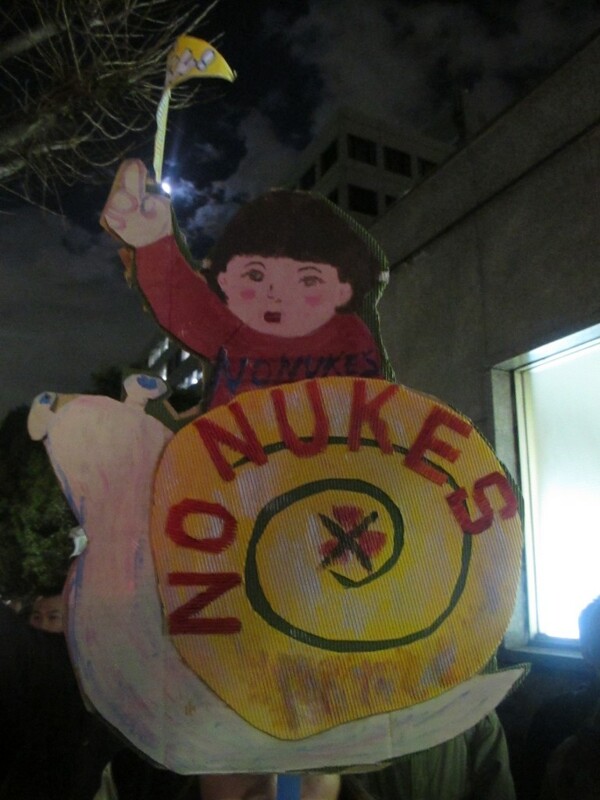 I’ve been thinking and writing about Japan’s anti-nuclear movement from afar for a while now, catching in news reports, blogs and activist-scholars’ analyses some of the thrill of renewal the movement represents. But it’s only last month that I got a chance to see all this in action for myself, stopping past at the weekly Friday evening demonstrations outside the offices of officials in Kasumigaseki during a trip through Tokyo. It’s the first time I’ve been back in the city in three years, and the cultural impact of the movement is there to be felt. An important political shift is going on, and its significance and implications are only just beginning to be sensed, let alone assessed. I’ve provided an analysis of the movement’s origins and dynamics elsewhere (in an article in the latest Marxist Left Review) and won’t rehearse those arguments again here. What I want to sketch, instead, is some more intimate and personal sense of what all this means, and might yet mean still. My article had to go to the printers before Japan’s last round of elections – Abe’s political resurrection, and the gaggle of far-right and populist forces in the cabinet and flanking the LDP’s return to power pose new challenges for the social movements, obviously. 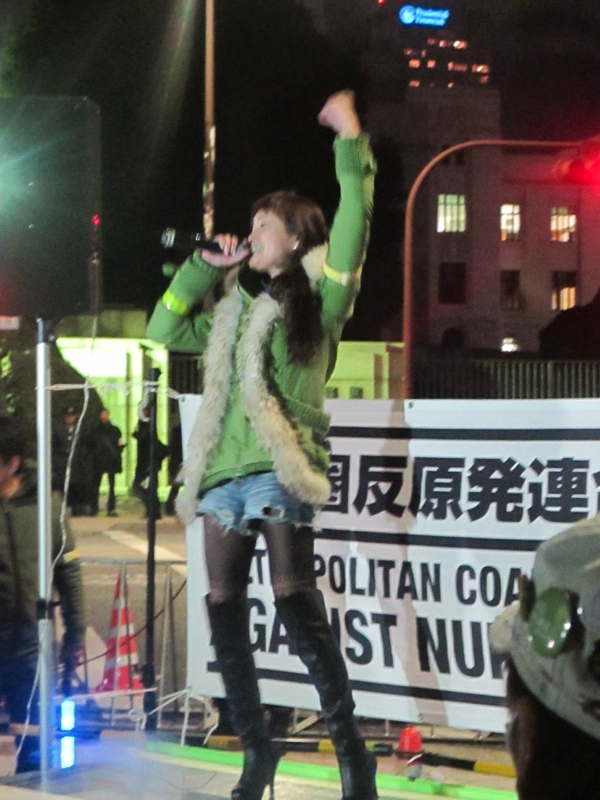 For the moment, though, the LDP’s restoration has given new energy to the Friday protests. After something of a lull for a few months, people have returned, activists told me, as they sense that the demonstrations may be under threat. Any given Friday could be the one the cops decide to stop tolerating this democratic awakening, a situation they’ve never been best pleased over. The need for solidarity gives abstract commitments a new focus. There were several thousand people out on the cold January night I went – the movement’s ready for a fight. Arrests prompted a big solidarity demonstration in Osaka. Politics’ lines are clarifying, and resolve is hardening. At the centre of resistance is a tent outside the Ministry of Economy, Trade, and Industry, a reclaiming of public space that has been defying official warnings, police threat, attacks from rightists and the weather for well over a year. It’s quite a sight in Tokyo, where busking, political leafleting or postering are almost impossible. 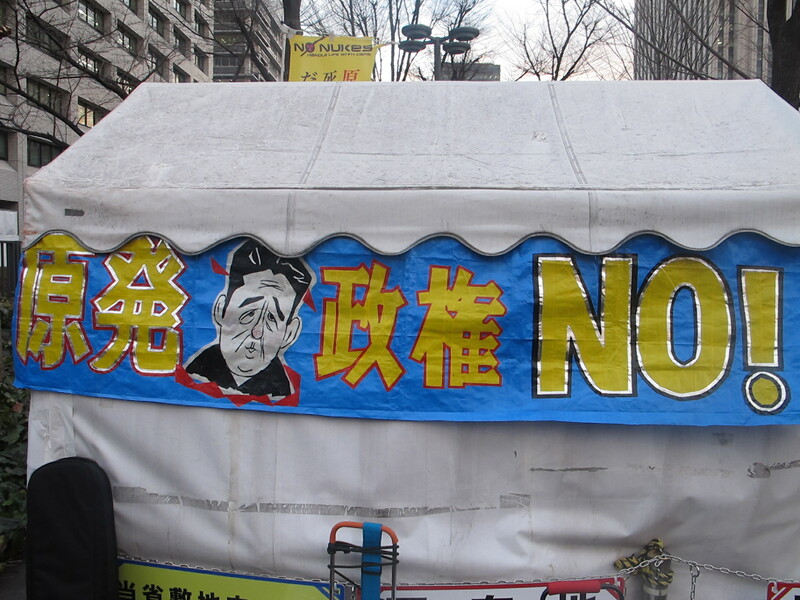 At a busy corner of the government district anti-nuclear flags fly, banners wave and the movement’s presence insists on being felt. 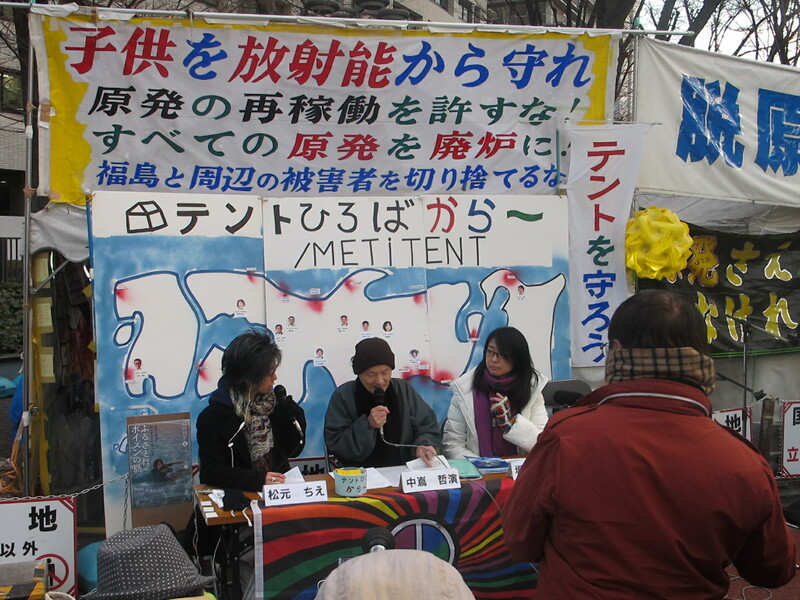 Staffed by refugees from Fukushima among others, the tent offers a little portrait of the politics of the movement. It has a well-developed web presence, including a TV channel broadcast live each Friday, but it’s also a place you can go and have a chat, sounding out arguments around strategy and tactics. Whose streets? The tent is ringed with signs warning sternly against loitering, their ineffectuality providing the opposite answer to the one the bureaucrats intended. 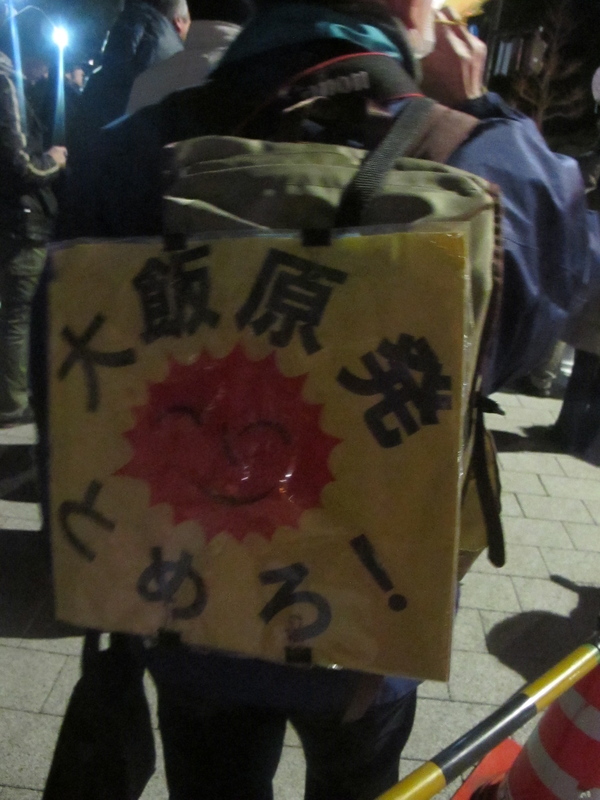 I’d read reports of the make-up of the anti-nuclear movement, but it took an evening among the crowd to get a sense of what this new generation could mean. The protest stretches across several blocks, symbolically surrounding the centre of power, and different groups have their regular spots. Wandering around with a camera I got the chance to talk with a range of people: a circle of colleagues from a Saitama insurance firm who travel in with handmade signs; a pair of veterans from the 1960 Security Treaty struggle; university students who go to the protest on their way to work at a Shibuya izakaya; partisans of Tanpoposya, Japan’s longstanding anti-nuclear group; Communist Party sympathisers; punks from a Chiba band. What is significant and hard perhaps to convey outside of a Japanese context, is that these groups are talking together, placed in contact with each other in ways the ‘culture’ of the Japanese left hasn’t always made possible. Long years of defeat and reaction have produced in parts of the Japanese left methods of survival that produce sclerosis, division, sterility. (There are often as many as three or four separate and competing May Day marches in Tokyo.) This feels different – the chants are shorter, the leaders younger, the atmosphere more informal, more open to discussion, to conversation, to connection. And yet, the Metropolitan Coalition Against Nukes and other organising coalitions insist on a ‘non-political’ stance. I had known about this situation before I went – and its hardly unique to Japan, as recollections of the Occupy movement globally ought to remind us – but the consequences of the ‘no politics’ position still managed to shock me. Union and socialist flags and banners are not welcome at the demonstration, all ruled out under the insistence on ‘no politics’, so many hundreds of trade unionists appear as atomised, anonymous individuals, their organisations’ honourable stand unrecognized. At the same time, however, people are free to bring Japanese flags to the protest – a deeply political gesture, all the more significant for it not being treated as one. I saw only two flags the evening I went – and neither person waving them gave me permission to photograph them – but their effect was chilling. A revival of radical thought and free expression around the movement will not be contained by artificial divisions between the political and non-political for long. 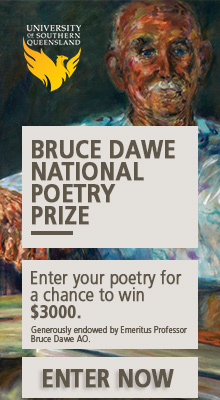 The ‘fissures in the planetary apparatus’ open new spaces for theory, thought, reflection. A more positive political challenge awaits in the form of the Upper House elections later in the year. Anti-nuclear candidates did poorly this time round, with a fractured field and disparate slates adding to dismal voter turnout, especially among the young, and jingoist mischief to undermine any left or progressive results. But there is now a Green Party registered in Japan and ready to field candidates on an anti-nuclear – and socially progressive and economically left-wing – platform. Some socialist activists I spoke to felt that there was potential for a broad-based campaign in support of the Greens around the Upper House elections uniting those inside and outside the party. It will be an interesting debate to follow. I am in no position to assess the viability of value of a campaign of that kind, of course, and don’t presume to lecture the activists there. But what a thrill, to be able to hear debates and discussions about strategy occurring as naturally as office small talk! So many strangers, but also a collectivity: huddling around the tent embassy by METI, we wanted to know each others’ views because, unusual enough in this society, we had the sense our views might matter. That’s catching. The Metropolitan Coalition Against Nukes have a No Nukes magazine to distribute now. It’s a good read, and is getting distributed on the streets. All this might sound like the workaday pedestrian details of activist lives in Austalia but, in the Japanese context, it represents a real extension of democratic space and energy. Every question ‘runs in a vicious circle’ because political life as a whole is an endless chain consisting of an infinite number of links. The whole art of politics lies in finding and taking as firm a grip as we can of the link that is least likely to be struck from our hands, the one that is most important at the given moment, the one that most of all guarantees its possessor the possession of the whole chain. 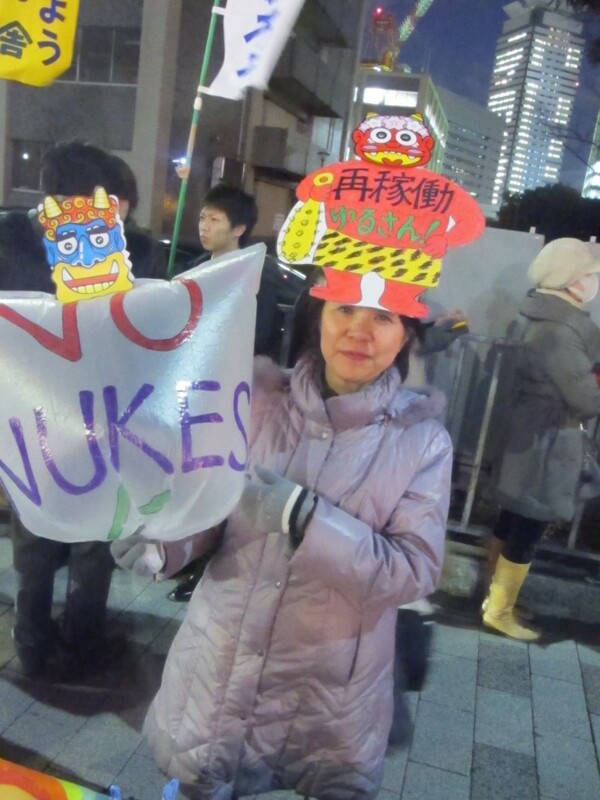 The question of nuclear power feels like it is that kind of link in Japan – the protests on Friday tackle an issue that, in its combination of immediacy, urgency, and universality, forces a confrontation with the entire order of Japanese capitalism. Nuclear power is an intimate question: ‘Think of the children!’ we shouted, managing the line without an embarrassed sense of irony for the first time in my life. It is universal and system-wide in implications at the same time. 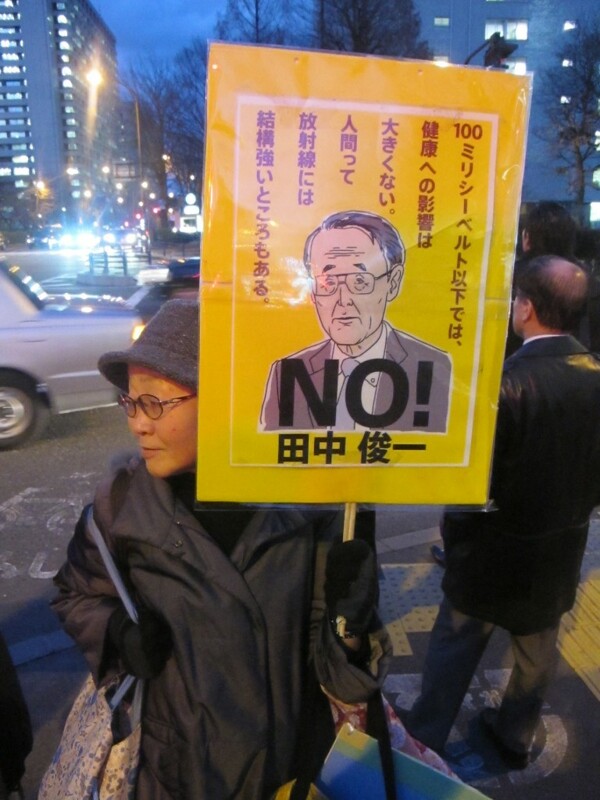 Fukushima’s rebuilding raises questions of democratic control, planning, workers’ rights. Safety – and who decides when and where nuclear plants will re-start – pose the same kinds of question. The uses of power, and society’s needs and direction, demand examination. All of this takes place within a state system still shaped by the US occupation and after – by the nuclear bomb, the nuclear-fueled Cold War, and nuclear-powered bases. 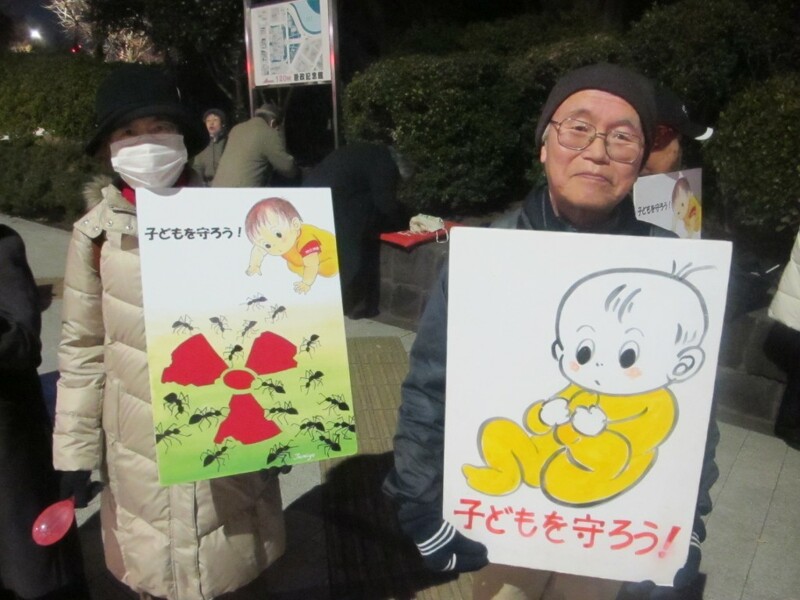 The Sunday I left Tokyo thousands protested against Osprey, the hybrid aircraft the US plan on deploying at their bases in Okinawa. Nationalist distractions can work against all this, for sure, and have terrifying possibilities of their own. These can be revived, and revived in the face of more pressing economic problems and issues, as the last election showed. But that threat offers nothing new, in either its faces or slogans. And the anti-nuclear movement poses hard questions. Some among its ranks are searching their way toward hard answers. It was a thrill and an inspiration, on a chilly January evening, to get the chance to stand among them. This might seem like a stupid question but in your opinion does the Japanese movement throw any light on the almost complete disappearance of anti-nuclear sentiment in this part of the world? I mean, obviously, Japanese history is different and the consequences and risks of the nuclear industry have been rather dramatically revealed. Yet it does seem odd that a movement that once regularly drew hundreds of thousands of people to the streets and nearly split the Labor Party should be so completely absent, even as uranium mining becomes more and more commonplace. Anyway, would be interested in your thoughts.